When you walk down the cleaning supply aisle at the local grocery store, it is extremely easy to get both overwhelmed and confused by the many products on the shelves. While everyone has their own personal preferences when it comes to buying cleaning supplies, I find that what frustrates people the most is trying to find green cleaning solutions that actually work. Trust me when I say, that it is definitely not an easy task to replace traditional cleaning supplies with those that are earth friendly and highly effective. Being in the cleaning business I have personally tried dozens of products that promise a better cleaner world, but fail miserably when it comes to cleaning a toilet. In fact, if the truth be told I sometimes wonder if almost all green cleaning supplies are nothing more than water with food coloring. Even though I would love to start a “Don’t waste your money” cleaning supply blacklist, I do not want to spend my valuable time in court. Instead, what I have decided to do is showcase a product from time to time that I have found to be both an exceptional value and extremely effective. This is of course my own personal opinion and you are free to use whatever products you like. I do not receive any personal benefit for recommending a product and I do not have any connection or allegiance to any one brand. I believe that it is in a company’s best interest to use what works rather than to settle on one particular brand of products. The first product I would like to showcase is one that I used by accident. The other day we were scheduled to clean a home with laminate flooring but ran out of our particular brand of floor cleaner. 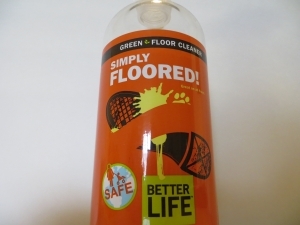 Running into a local Waukesha grocery store, I ended up purchasing a bottle of green floor cleaner called “Simply Floored” by Better Life. I must say that the name certainly was accurate. I was “Simply Floored”. Most green floor cleaning products make the promise that they will give your floor a shine but fail to deliver. This product by Better Life definitely lives up to its billing. What I particularly liked about the product was the smell. “Simply Floored” uses citrus and mint essential oils to give its product a wonderful natural aroma. Hence, you get a beautiful floor and a natural room deodorizer all in one. According to the Better Life website the product can be used on “hardwood, tile, marble, bamboo, vinyl, laminate and other sealed floors.” Check out the Better Life website for more information. Definitely worth a try!